Weather-wise, things have been just a bit too Seattlesque for my taste this spring. Now that we’ve (hopefully) seen an end to the seemingly endless rainy, grey days, it’s time to get outside and enjoy our fine Bay Area weather. May is one of my favorite months in the 650, not only because our usually fine weather settles in and days are longer and sunnier — but also because all of our neighborhood farmers’ markets are back in full swing. While we don’t lack for year-round markets in the 650, some neighborhood markets, such as Los Altos, Palo Alto Downtown, and Half Moon Bay close during fall and winter. For those of you who might have been missing your local market, the wait is over! Here’s the list of markets re-opening in May. April and May are a transitional time at the market as we’re seeing the last of “winter” produce, such as root vegetables and citrus, and the arrival of beans, peas, and stone fruit. If grocery shopping isn’t on your agenda, farmers’ markets are a fun place to grab a meal and enjoy the sunshine while people watching. Just a few examples from my recent visit to the Palo Alto Sunday market on California Avenue: dim sum, grilled meat sandwiches, bahn mi, sushi, and homestyle Mexican dishes with handmade tortillas. There’s something interesting to taste whatever your food preferences. Need to know which market is when? Following is handy-dandy list of all farmers’ markets in the 650, with 2017 opening dates. Click the market link for more info, such as location, parking, and vendors. Now get out and support your local food system; meet the people who grow your food and nourish our communities! Tell me: what is/are your favorite farmers’ market(s) in the 650? Not only do Jan and her husband, Lou, own and operate AppleGarden Farm and AppleGarden Cottage bed and breakfast, but they also produce hand-crafted AppleGarden Farm Hard Cider from organic heritage apples on their property. Phew! Talk about a creative and energetic couple! Welcome hugs and hellos said, I left Jan to prepare for cider tastings, while I headed over to Miette Bakery to inhale indulge in a macaron or three. 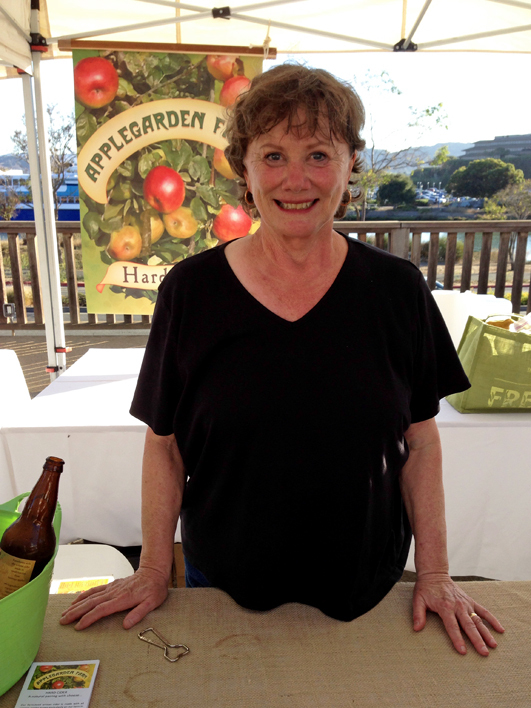 As the tasting portion of the event kicked off, I started my Marin food “tour” with a glass of Jan’s AppleGarden Farm Hard Cider while we chatted a bit about her business and customers. The cider itself is flavorful, crisp, hardly sweet, and a touch effervescent — what a pleasant surprise! I think the first thing I said to Jan was “It’s not sweet, or too bubbly!” She smiled knowingly and then mentioned that it paired well with oysters (Hog Island was at the table to our left) and cheese (to our right). The fat Hog Island Oysters were calling me, so off I went. For two hours, I happily tasted some of the best local, organic, and handcrafted food from the northern 415 and western 707 (aka, West Marin), sipping Jan’s cider in between tastes of North Coast biodynamic wines. 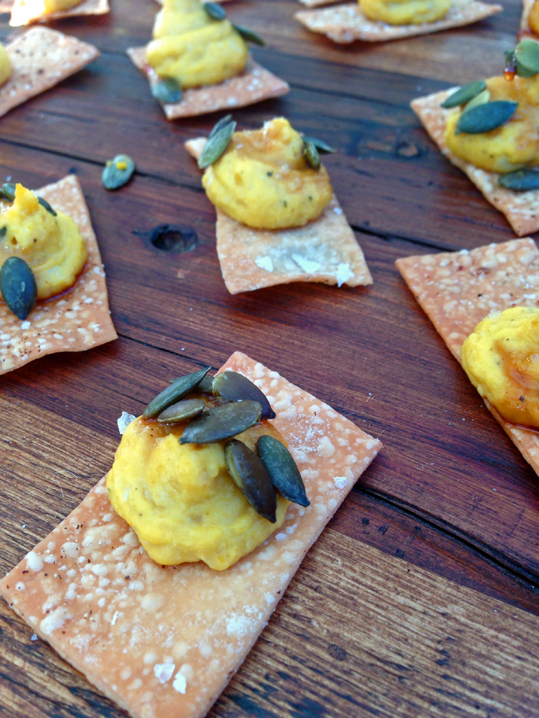 Here are some the highlights from my Bounty of Marin Organic tasting experience. What could be better than freshly shucked local oysters?! Apparently freshly shucked local oysters with a glass of Jan’s cider. Seriously. I’ve been challenged to find a good beverage pairing with oysters, but this could be it for me. Mindful Meats is a wholesaler that works with organic dairy farmers in Marin and Sonoma counties to source and provide pastured, organic, non-GMO meats. 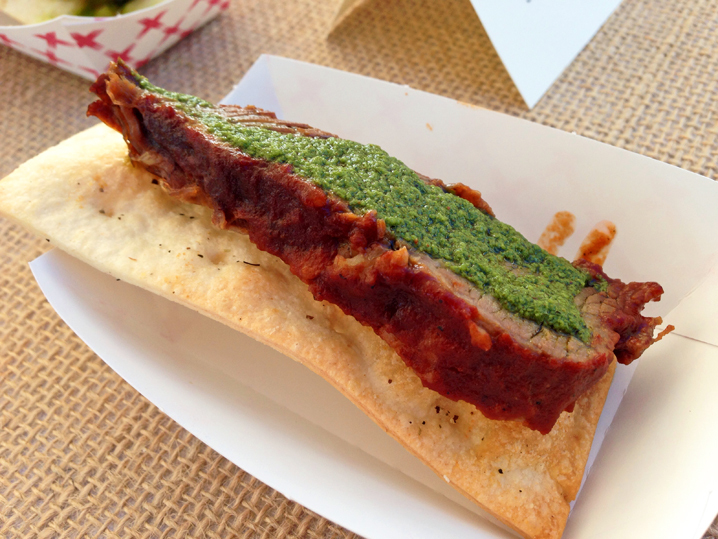 They partnered with Left Bank Larkspur, providing the beef for a Gaucho-Style Braised Beef Brisket with Chimichurri Sauce. The meat was so tender and flavorful, while the sauce added some spice and contrast to the rich meat. Alongside the pastries (which were snapped up almost as soon as they arrived on the table), was a display of Gospel Flat Farm produce used to make the pastries. Need I say it? A great example of farm-to-table creativity. 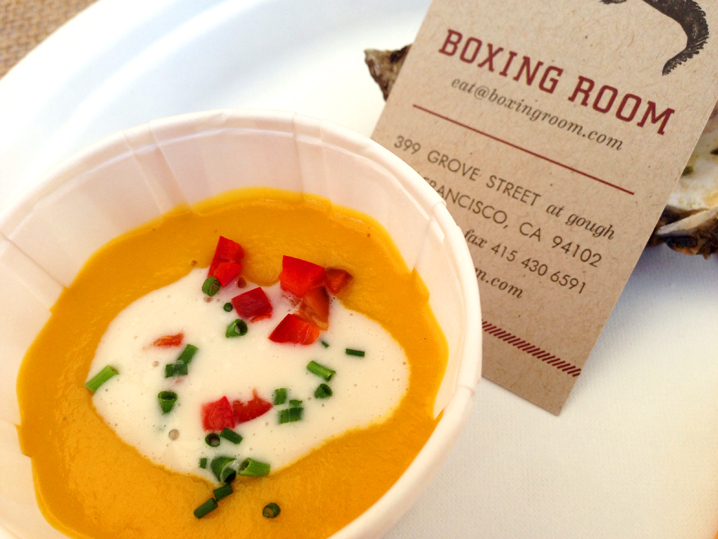 The Boxing Room’s pumpkin soup, on the other hand, was rich with a hint of spice. It’s the kind of soup I’d crave while curled up in bed on a cold, rainy night, but that could be fancy enough for a dinner party. There was already plenty of buzz about “the soup” before I got to try one of the last few samples, and yes, it was worth it. This event was a fun (and filling!) 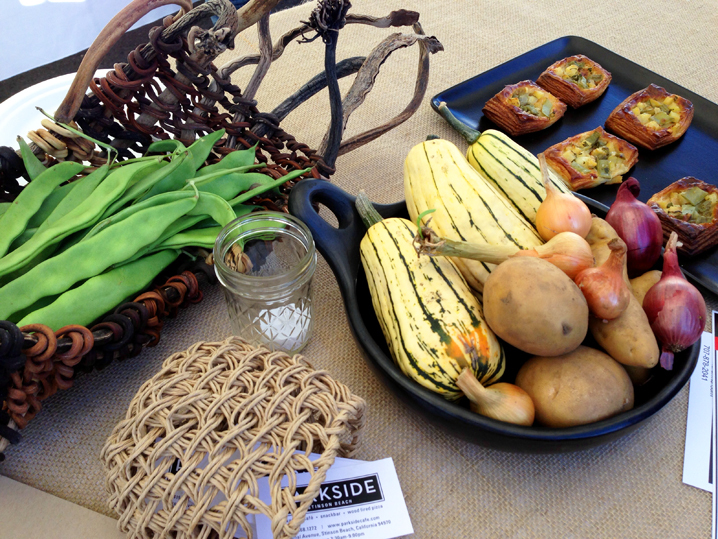 opportunity to enjoy some of the best food that Marin County has to offer. I love the fact that an organization like Marin Organic exists to support and promote the local, organic and handcrafted products of the area. I’ll be back Marin, I’ll be back! 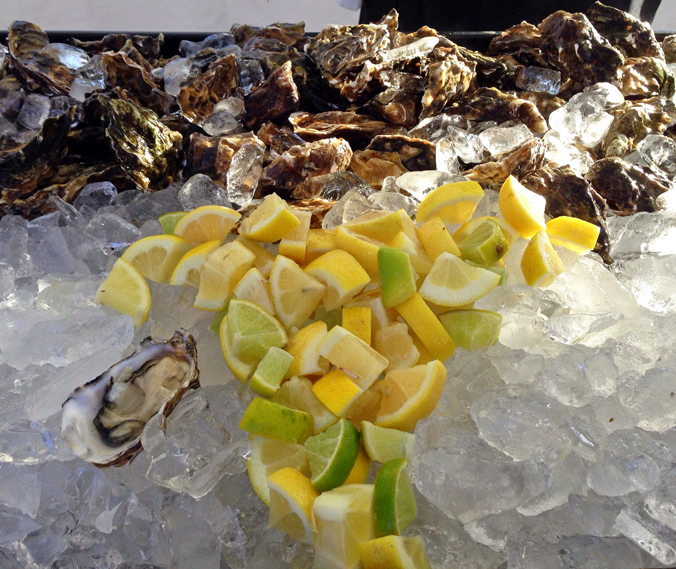 Have you experienced the bounty of Marin? What did you eat? Local oysters? Organic cheeses? An amazing restaurant meal? 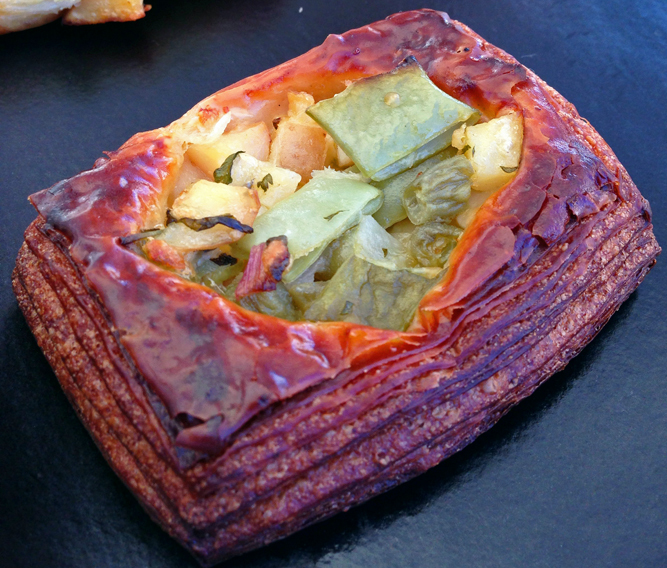 Share your Marin food experience! *Full disclosure: I attended Bounty of Marin Organic as the guest of Jan Lee. My opinions are my own and not provided in exchange for attendance at the event, nor at the request of Marin Organic, Jan Lee, AppleGarden Farm, or any other participants in Bounty of Marin Organic. You are currently browsing entries tagged with organic farms at 650Food.